Q: I have fresh batteries and the Low Battery Light flashes. What’s up? If your Pet Stop® receiver’s low battery light starts flashing after only a few days, weeks (or otherwise too soon) with a new battery, or, even as soon as you put in a new battery, take it out and put it back in again. Replace it if the light continues to flash. A cold battery can cause this condition. If the low battery light begins to flash, it will NOT stop flashing on its’ own until the battery is dead in a few months. You must open the battery cap and then reclose it. You do not need to remove the battery. If removing the battery cap and replacing it stopped the low battery light from flashing, then you have proven the condition and you need not worry about it again with that battery until later when the battery truly enters a low condition. Cold temperatures, (Cold outside or from your dog lying on the AC vent with the receiver battery chilling) even a fairly new battery can experience a low battery light trigger. After the light triggers, a battery can rebound back to “Normal”. However, the light remains actively flashing. If this occurs, it indicates the battery was a higher milliamp battery. That is a good thing, as it will last longer than a low milliamp battery. But it is inconvenient if this occurs, as you must open the battery cap to reset the low battery indicator. This usually will not happen more than once a battery’s life. NOTE: After you open and close the battery cap, it is also good to walk the receiver collar into the fence signal and activate the receiver collar. A couple of “Beeps” rapidly activates and uses a bit of battery. Lithium batteries in use can last longer when they are periodically activated, rather than if you leave them on a slow drain in the receiver. If after you tried the battery in your collar again and discharged it a little with the fence beep, if your receiver immediately begins flashing again, replace it. We hear this a few times a week. Often people think that the collar is not working after the battery is replaced. People expect the light to now come on steady because the battery is new. This is not correct. The LOW BATTERY LIGHT does NOTHING and the receiver does not beep to confirm the battery is good. The battery light does not glow steadily any color. Nor does it flash any color. Nor does it beep. Warning: If your collar low battery light begins flashing again immediately after you put in a new battery, or within the next day or two, please do NOT assume the battery is bad and replace it. Instead, try the remedy detailed above. 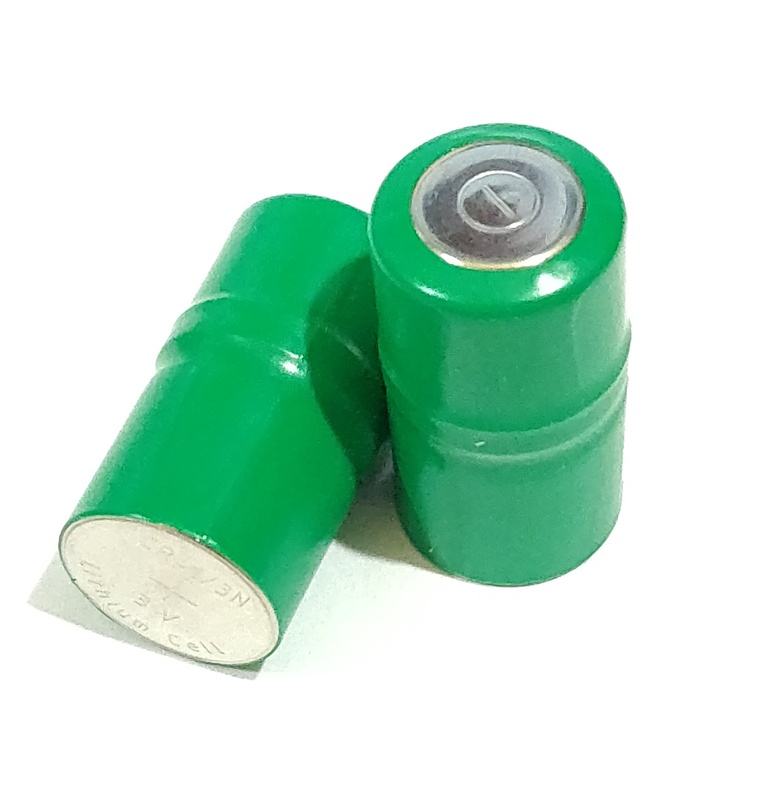 If you continue to have problems and you did not buy your battery from us, we cannot help you until you have tried a fresh battery that you purchased from us, and the battery was stored in the original factory protective clear shrinkwrap. If you have problems and you are using our battery, we will stand behind it. Batteries from specialty shopping strip retailers are not welded and often, therefore, fail as soon as you get home. This can only be prevented with our welded high output batteries. This is what our battery looks like. The color and text on the shrinkwrap may vary. ABSOLUTELY ANY AND ALL OTHER BATTERIES VOID YOUR PET STOP WARRANTY. Note: Batteries known as 2CR1/3N, 28A, PX28, 6231, 2CR11108, 2CR-1/3N, 28PXL, V28PXL, K58L, 5005L, L544, DC5 and ANY of their equivalent batteries voids your warranty. These other batteries are just a little too long and a little too fat. Do NOT use them in your receivers. Do NOT permit a battery salesperson to insert or force these batteries into your receiver. Eventually, the stresses on the receiver plastics will cause them to crack and fail, and you will be buying a new receiver. Note: While the battery we sell is labeled “2CR1/3N”, they are specially configured to fit our product while similarly labeled batteries found on other internet stores are not configured for a proper fit in our receivers. Most are longer or too fat or both. While you may be able to force or even slip one in and screw down the battery cap on your receiver, and your receiver will work. However, because of their dimensions, the battery cap will have to be forced closed and over time, excessive pressures will cause damage to the contact spring or crack open the case. The failure is obvious to us and our manufacturer. Your warranty will be immediately void when such damage is detected. You have been warned. If you purchase batteries from sources other than Pet DeFence, we cannot warrant how long they last. If batteries from other sources run out quicker than you expect please consider purchasing your future batteries from us. Our customers tell us our batteries last longer and therefore cost less in the long run. The “+” side faces out when you insert new batteries into your receiver. “Always be POSITIVE to see the POSITIVE” facing out. Why is there a red light flashing on my receiver collar? TIP 2: It is a good idea to check the battery before you go on vacation and again when you return. If you do not test, and your battery is dead, your dog will figure it out. You never want this to happen, especially when you are on vacation and your neighbor is watching your dog. Tip 4: Segregate your old batteries from your new ones and dispose of your old batteries immediately. An old battery looks like a new one and serves only to confuse you next time you go to change batteries. Tip 5: When you buy a two-pack of batteries from us, do not unwrap them both. Leave the unused one wrapped in the original clear packaging it arrived in. This way the battery will never short while in storage and you will have a clear indicator that this is a NEW battery and not an old one you forgot to dispose of. Tip 6: Lithium batteries pack a huge amount of energy into a very small package. So much so that they can cause a fire if shorted out under a perfect storm scenario. Therefore, NEVER store any loose battery together with another battery or with paperclips, magnets, etc. Each battery should be isolated from others and other loose odds and ends. Loose batteries can create a circuit and short each other out, running them down in a few hours even if they do not cause a fire. If your PetSafe® Professional receiver flashes as soon as you replace the battery, this is normal. It means that your batteries were completely dead or you left them out of the receiver for a few minutes. The number of flashes indicates the shock level of the collar. When you purchase batteries for your PetSafe® Professional P4 receiver, please purchase only the following batteries: CR2032 or an equivalent.